Speed up the results of your training as you work towards your goals with these New Balance Accelerate 7 Inch Training Shorts in Marine Blue. These men's training shorts from New Balance have an athletic fit and provide a secure and comfortable fit courtesy of an elasticated waistband and adjustable internal drawstrings. Pockets at the sides also allows the wearer to hold onto their essentials as they exercise. Made from polyester material, these training shorts feature NB dry technology which is designed to help keep the wearer feeling drier and more refreshed as they exercise by wicking sweat away from the skin and quickly drying off. Ventilated mesh side panels improve air circulation and also adds a cooling effect. 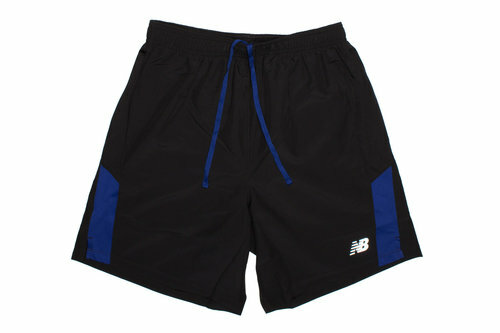 Go faster and push your fitness programme to a whole new level with the New Balance Accelerate 7 Inch Training Shorts.